Two new books arrived on my doorstep over the weekend, courtesy of Harper Collins. 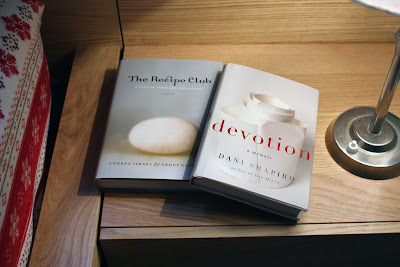 They were Devotion: A Memoir by Dani Shapiro and The Recipe Club: A Tale of Food and Friendship by Andrea Israel and Nancy Garfinkel. I am a true fan of memoirs so I am excited to dive into the pages of Devotion first. The Recipe Club seems like an interesting read as well. An excerpt from the jacket cover reads, "Loyalty, loss and the ties that bind. These are the ingredients of The Recipe Club, A "novel cookbook" that combines an authentic story of friendship with more than 80 delicious recipes"
I will certainly be trying some of the recipes in this novel cookbook which include cleverly named: Starry Night Scampi, Catcher in the Rye Bread, Wash-Away-the-Blues Berry Cobber, and Smashing Smashed Potatoes. Mmm... speaking of recipes, here are a few new ones that I have tried lately that have been a succes! Pioneer Woman's Spicy Shredded Pork and Twice Baked Potatoes. I also recently made a Lemon Meringue pie from my Joy of Cooking cookbook (1997 version). It looked as gorgeous as it was tasty! Another great treat is Chocolate Covered Toffee posted by Nicola from which name? which I made as gifts for the holidays. I have been dreaming of it ever since. So good! I'll also leave you with a recipe that is a surefire hit with our family every time; a quick crock pot meal for those days when you would rather spend your time reading than cooking. Put the above ingredients in the crock pot in the order listed. Set your crock pot to 4 hours on HIGH or 8 hours on LOW. 1 hour before serving, drain the juice from the spareribs & onion and add one bottle of your favorite BBQ sauce. Continue to cook for the last hour. Serve with mashed potatoes, rice or pasta on the side. What words and foods have you been feasting on lately?